I was looking through some exclusive ST games when I came across Red Ace! I thought hold on that looks very familiar! Then yes, I remembered it looks very like Power Factor on the Lynx! Red Ace was made in 1988 by Red Rat Software and Power Factor in 1992 by Handmade Software..is there any relation? Ex developers? Ripped off ideas? Or just purely extreme coincedence!? I liked the idea of Power Factor and it played quite well but the small screen viewing size made it hard, maybe the ST version plays better, will have to try it soon. Re: Are these two games the same!? any videos or pics to back this up?? Oops sorry I'm on iPad bit fiddly, here's some links. 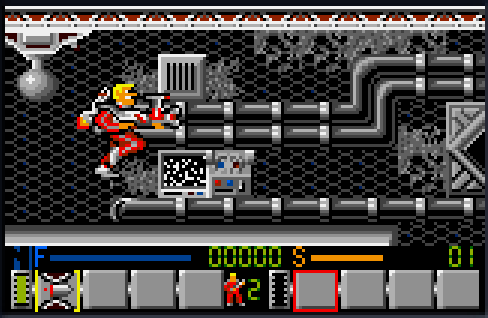 Other than the gun he's holding in the Atari ST version it seem you are correct and a the revamp on the of the bottom interface, I think either the sprites where either reused , possible donated by the original artist or this is ex-team effort, but they are definitely the same main sprite. That certainly looks like the same game and the character in Power Factor is called Redd Ace so I am pretty sure that they are either the same game or the Lynx version is a sequel. That's a great find, very interesting indeed! I just found this interview where the coder says that the company went bust before Redd Ace was released. Hey thanks guys, knew it looked very similar! Must download the ST version demo or otherwise and see what it plays like. Team RVG the retro investigators. Lol.